John MacPherson is an FEI Competitor, Trainer, Level III Dressage Coach & M Level Judge. He has represented Canada internationally for more than 25 years, and has twice won the Bronze Medal at the CDI-W Dressage at Devon. He will be teaching private slots, 45 minutes in length. $140 private. Tiara is equipped to run fantastic clinics, year round. With a heated viewing lounge and an excellent speaker system, spectators can stay close to the action, or comfortable in the lounge. We provide refreshments throughout the day. Jessica is an FEI dressage rider who has represented Canada on the international stage on numerous occasions. Jessica is an Equine Canada Level III coach and several of her students are enjoying success showing up to Advanced. Lessons are private slots, 45 minutes in length. $140 private slots. Auditors $25. Refreshments provided. Sally has worked with some of the top hunter/jumpers in the country during the 80’s, she went on to run a busy A show barn and now trains many top Eventers. Sally sits on the National Rules and Ontario Young Rider Committees and is a recorded course designer who builds for many of the OHTA events. Lessons are in small groups of 2-4, ranging in length from 1 hours to 1.5. Cost is $100, auditing $25. Refreshments available. Check back for more details shorty. 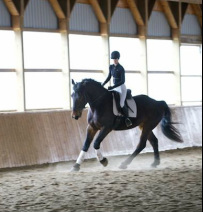 Tiara will be hosting a "Rider Level Prep Course" over March Break, with an examination at the end of it. Ship-ins are welcome, as are non-clients looking to rent a horse. Ship ins for the examination only, who are not looking to participate in the prep course are also welcome. Tiara is also looking into hosting 3 more clinics before show season. Send us an email if you have a special request.